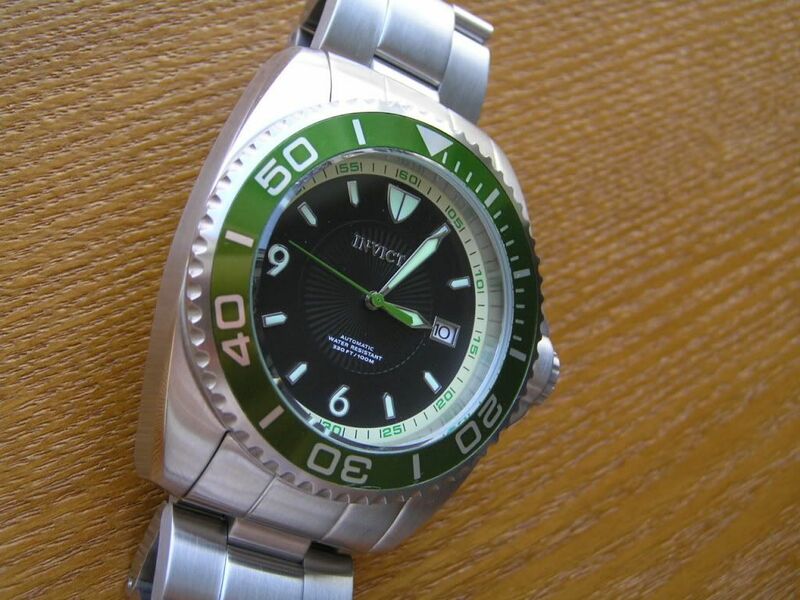 I’ve been intrigued by this Invicta Pro Diver with its Seiko-sourced automatic movement ever since it was introduced. Part of the ‘Master of the Oceans’ series, these watches are interesting combinations of subdued, clean designs, hefty looks and all-around versatility. First off, let me say that this watch is NOT 48mm as stated in the specs. 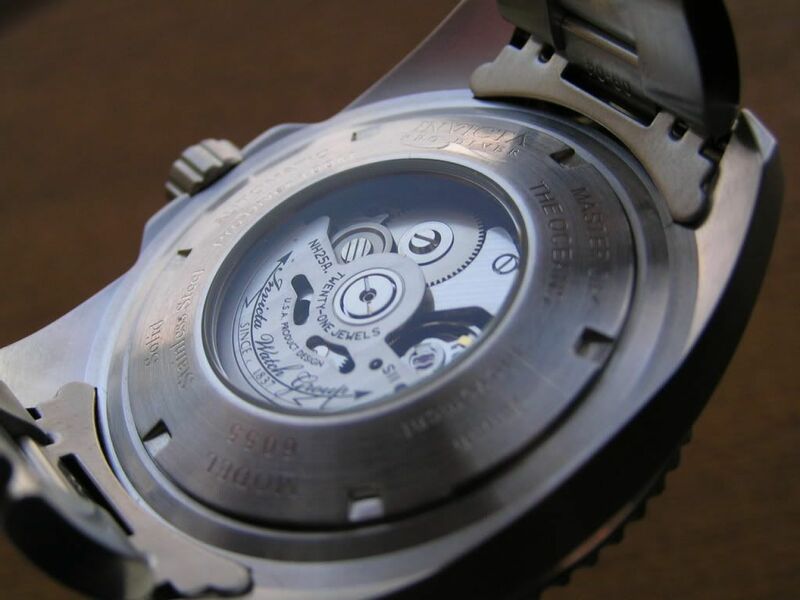 Depending on how you measure it, the bezel diameter is 45mm; when the watch is measured from the rear of the case, 46mm. 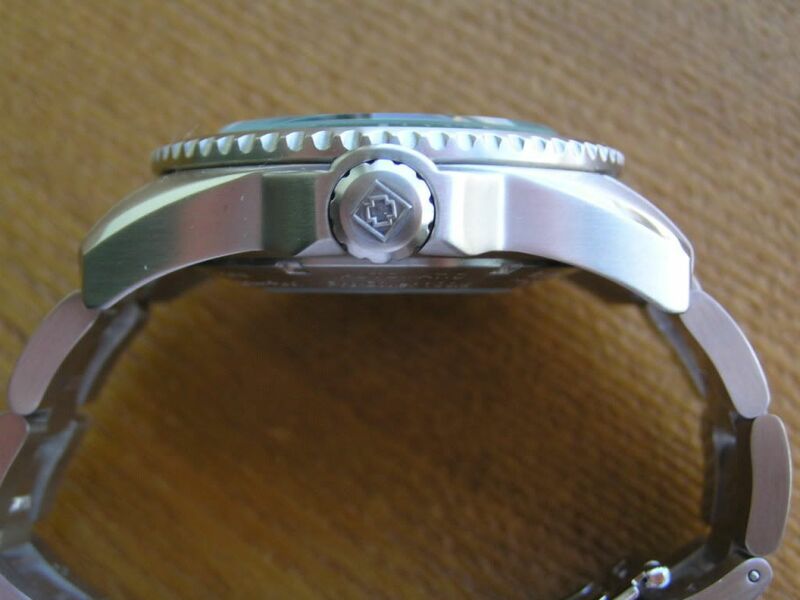 They seem to get the 48mm measurement by including the shoulders on the sides of the crown. Size with crown is 51mm. Lug-to-lug measures 54mm, lug width 24mm. The bracelet tapers to 22mm at the clasp. Watch thickness is 15.5mm. Also, due to the curvature of the case, this watch hugs the wrist very nicely and makes its still large size easier to manage. So if you have been put off by thinking this watch is just too damn big, don’t be, you may be pleasantly surprised. What jazzes me about this watch is that it retains some of the best Invicta traits and also does away with some of the worst. The case and bracelet are fully brushed, save for tiny edges on the case sides, so essentially, there is no polished stainless steel on this watch, which gives it a great look. 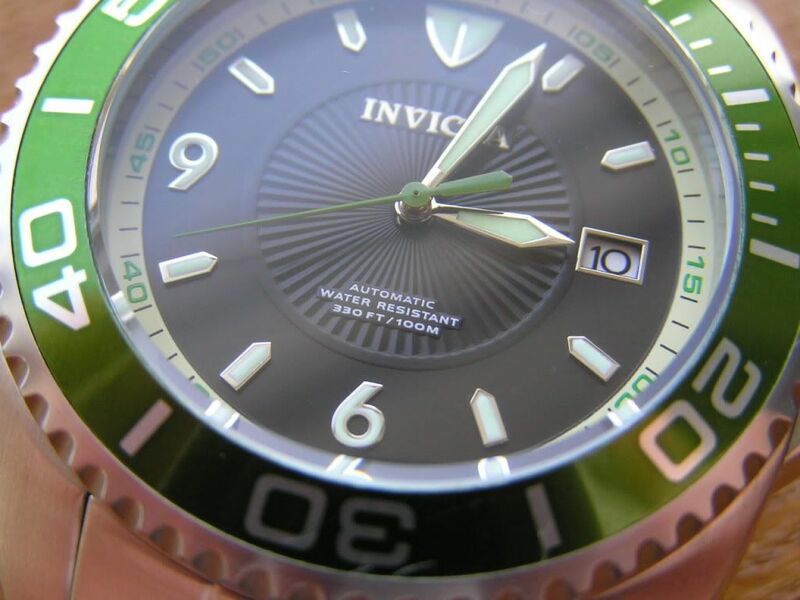 There is no garish ‘Invicta’ engraved on the side of the case and while the crown is nice and big and signed, it does not have the cheap-looking Invicta yellow and black plastic insert. The crown does not screw down. The black dial has a simple pattern radiating out from the center about half-way. The markers are applied, but are not too big. The hands are simple and effective, the quickset date @ 3 gets along without a cyclops and the bezel is a smooth 120-click affair without a lume pip to fall out or worry about. 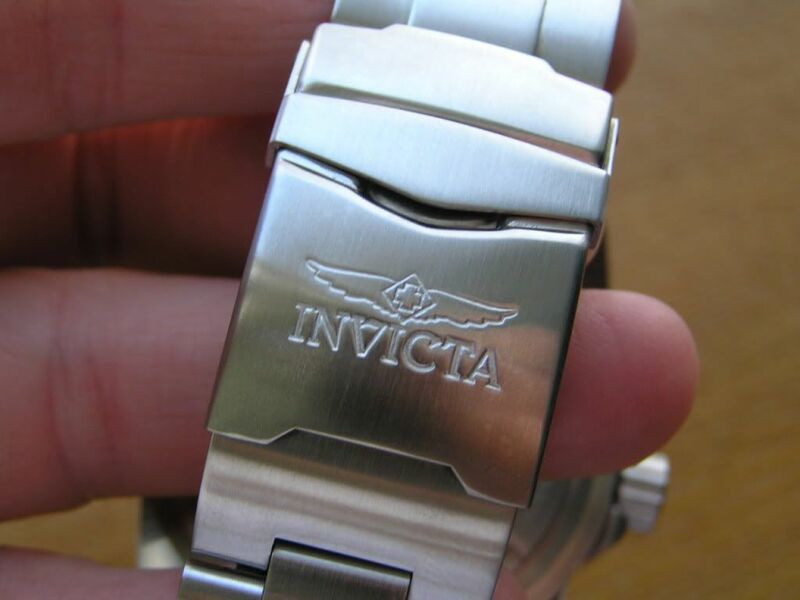 The bracelet is typical high-quality Invicta fair, solid links, finished smoothly with standard split pins for adjustment. The clasp is a typical signed, double locking unit. 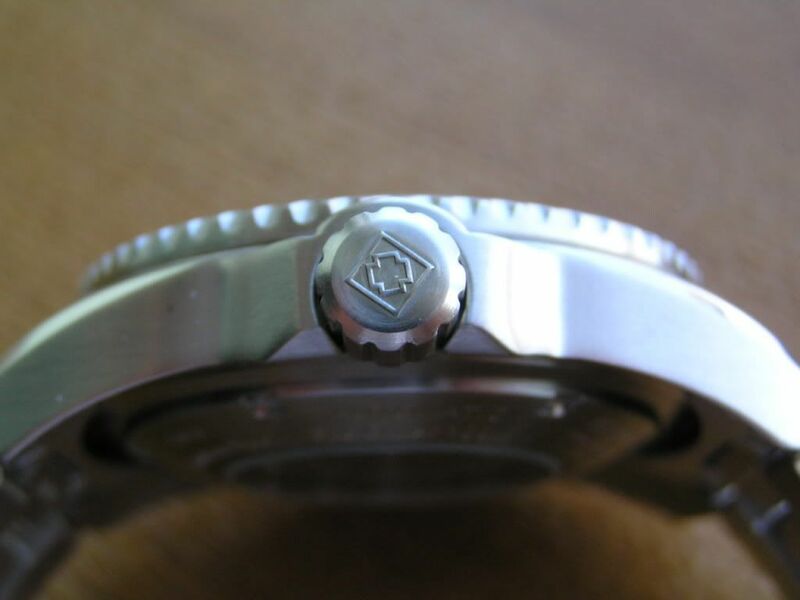 The deployant is stamped steel and the bracelet does not have solid end links. The Seiko-sourced 21-jewel movement does not hack or manual wind, but keeps fine time. The hands are perfectly aligned at midnight and the date clicks over promptly at this time. The crystal is heavy mineral. The display back screws down and is engraved with the watch’s pertinent information. The script on the rotor gives it a classy look. One thing I have noticed about this movement, it seems to take a lot of shaking/swinging to get it up to a full power reserve. It does not seem to power up as easily as a Seiko 7S26 movement. This is a 100 meter rated dive watch which may disappoint some, expecting a deeper rating. 100 meters is fine by me as I don’t even get my watches wet. 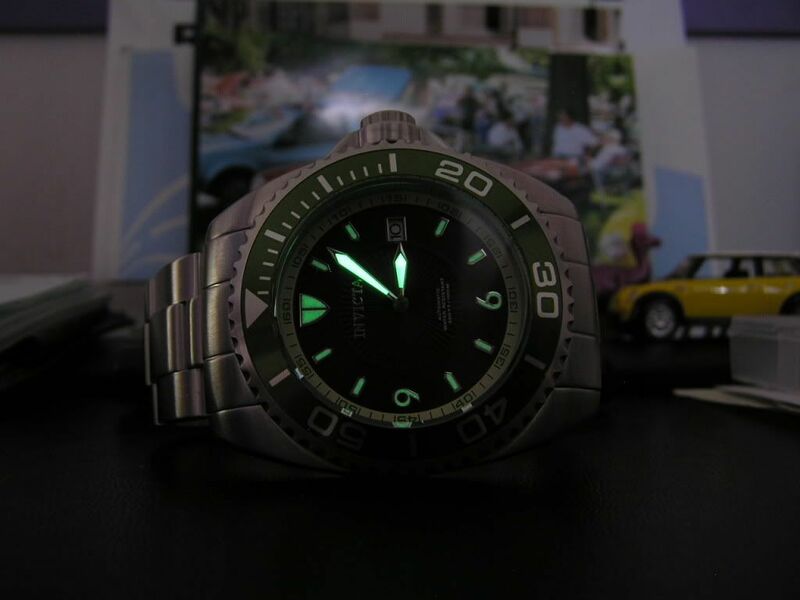 The lume is brighter on the hands than on the markers and could be stronger and longer lasting. The chapter ring on this model is a pale greenish white which may be off-putting to some, but I like it. 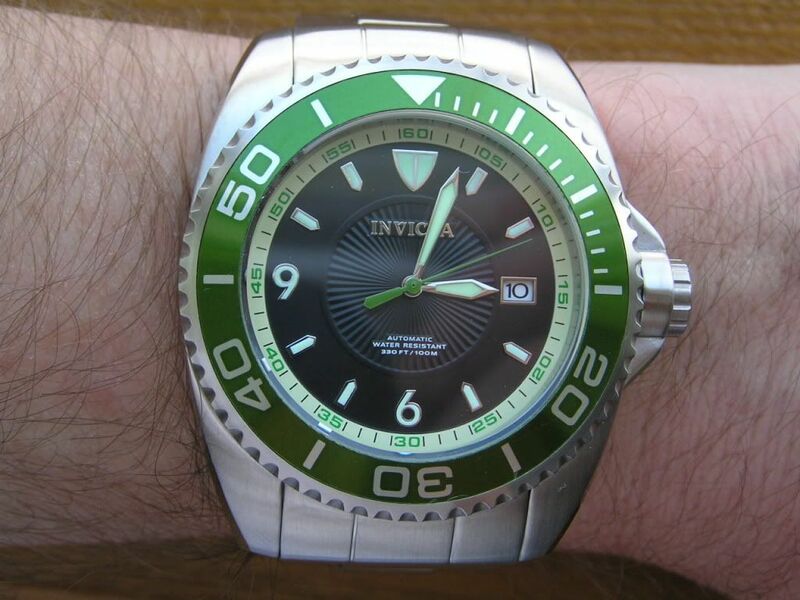 The green color of the bezel is just about perfect and the green second hand is a pleasing touch. 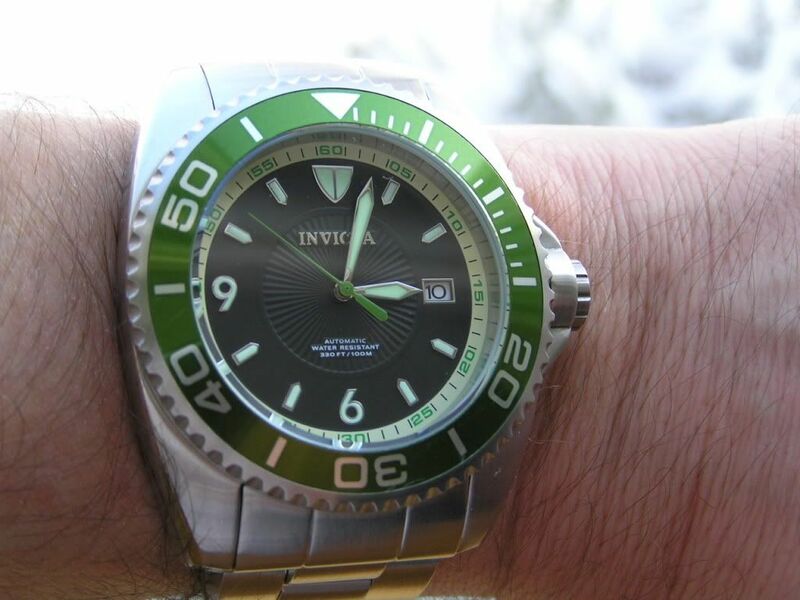 Overall, I will go out on a limb here and say that IMHO, Invicta got just about everything right with this watch. It looks strong on the wrist, is solid and heavy and has a great movement in it. These watches sell for around $100 on the street, even less if you snag one on sale like I did. For this price, this watch is an absolute steal and will do you proud. 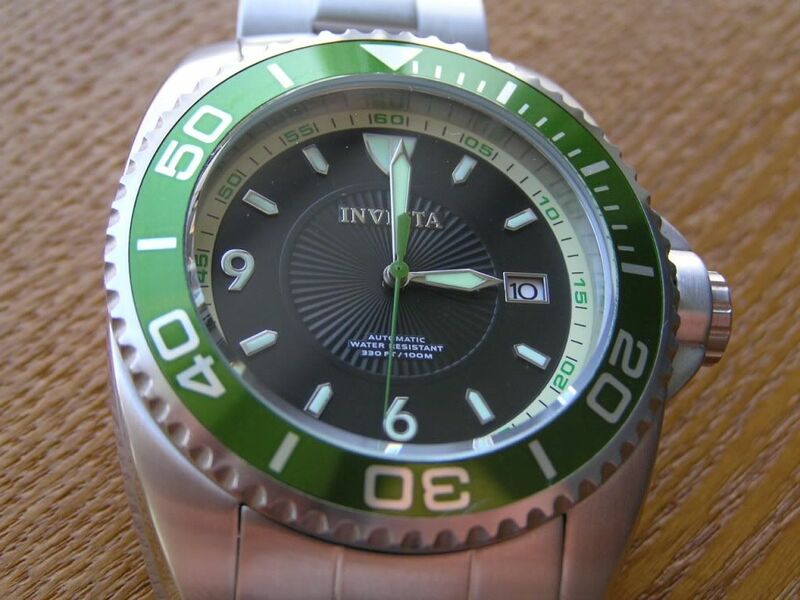 There you go, MCV says this Invicta rocks! These watches also come in a wide variety of dial colors, dial textures, rubber strap or bracelet models, so there is a lot to choose from. Thanks for reading and enjoy the pics! I owned this watch for about a year before selling it off to make room in my collection for, what else, another watch! Overall, I liked what this piece had to offer, especially for the price and would not hesitate to pick up another one if the mood ever strikes.